The article presents one of the few medieval cemeteries excavated in the Upper Struma valley. 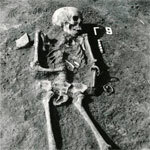 The yielded artifacts allow to conclude that the cemetery functioned in the period between the 11th and the early decades of the 13th century. The grave pits were cut deep into the deposits of Tell Galabnik, accumulated in the Еarly Neolithic. Re­mains of a settlement were discovered next to the cemetery. The settlement was situated on the only dry area in this region covered by swamps, and it functioned at the same time with the cemetery. The cemetery at the village of Galabnik is among the important archaeological sites in the Upper Struma valley. The grave goods it yielded greatly outnumber other medieval cemeteries excavated in this region, such as the cemeteries in Pernik, Priboy and Kyustendil. Most of the personal ornaments yielded by the burials were typical for the period and were also found in a number of cemeteries excavated in present-day Bulgaria, Mac­edonia and Serbia. The small number of burials, the simple burial structures and the fact that there were no later burials cut­ting through earlier ones allow to suggest that the cemetery functioned for a relatively short period. It has been argued that people of a relatively high living standards, who inhabited the area for a short period of time, were buried in the cemetery.